Behind a counter, a sign says: COMPLAINTS DEPARTMENT. Also behind the counter, a man is relaxing in a supine position on some sort of easy chair, with his head resting on his hands. A woman stands and faces the counter with her hands on her hips. Woman: I demand to know why you canceled my two one-way tickets to different cities. In the next panel, only the man is seen, in a closer view. His head is slightly raised and one of his hands is lifted a little higher. Man: Ma’am, our rules clearly say no open jaw. 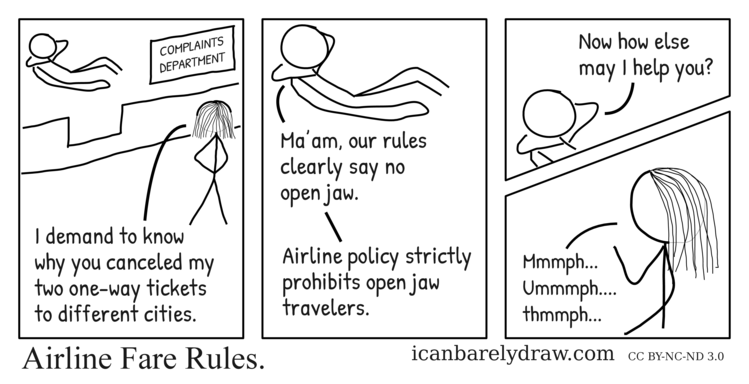 Man: Airline policy strictly prohibits open jaw travelers. The man is now seen in the original relaxed position, his head lowered down again to where it was before. Man: Now how else may I help you? The woman's hands are now in a gesticulating orientation.